Citizens Juries - Citizens Juries c.i.c. 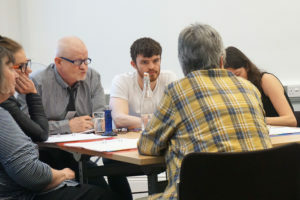 Two five-day citizens’ juries were held in February 2019 to explore the kinds of explanations people should be entitled to when decisions are made about them by, or using, artificial intelligence. 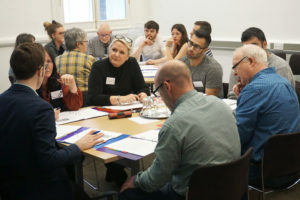 The first was in Coventry from 18 to 22 February, and then the same process was repeated with 18 different people in Manchester from 25 February to 1 March. Links to the results of these juries will be published here in April. To learn more about how we will protect personal data on this project, read this privacy notice for the AI juries. This citizens’ jury was held in Brighton and was a collaboration with the University of Brighton. It explored whether or not we should be more cautious about sharing free-text information in health records than structured data (like date of birth, GP code etc.). More information is available on the Healtex website – the sponsors of the jury. In January 2018, Citizens Juries c.i.c. designed and ran a three-day citizens’ jury in partnership with the Jefferson Center about when it is reasonable to share health records. For more information, including the jury report and all the project documentation, click here. Full details are published of two juries run in January 2016, and of two further juries commissioned by Connected Health Cities, and designed and run by Citizens Juries c.i.c. and the Jefferson Center in November 2016. Citizens’ Juries c.i.c. is a social enterprise dedicated to designing and running citizens’ juries in partnership with the Jefferson Center, the US- based charity which developed the citizens’ jury method. The Director is Dr Malcolm Oswald, an Honorary Research Fellow in Law at the University of Manchester. Citizens’ Juries c.i.c. is supported by the University of Manchester, and is a member of the Democracy R&D Network, a network of organisations around the world developing, practising and prompting ways to improve democracy. Citizens Juries c.i.c. asks jury applicants to provide personal data about themselves so that we can select a mix of citizens that broadly reflects the local population. Unless explicitly agreed with individuals in advance, we use this data solely for the purpose of recruiting, and running, citizens’ juries and do not share the personal data collected with other organisations, or use it for advertising. We protect it as required by law, including keeping it for no longer than necessary. In a citizens’ jury, a cross-section of citizens (e.g. in terms of age, gender, ethnicity, education) are recruited and paid to tackle a public policy question like “should we have a sugar tax?”. You can read how we select members of a jury here. The jury meets for several days and is provided with reliable, impartial information from expert witnesses. The jury members ask questions of the experts, and work together to reach group conclusions. Participants often complete questionnaires at the start and end of the jury to show how their minds change as they better understand the problem they have been set. The results are published, and can be fed back to public policymakers. Public authorities have many difficult decisions to make like: “how should we decide what drugs the NHS should pay for?” and “should there be fracking in Lancashire?” Opinion polls are important. They tell us what citizens think. But most policy questions are complex. Citizens’ juries give participants reliable information and time to explore difficult questions. They can tell us something that opinion polls and focus groups don’t tell us: what citizens think once they better understand a policy question. That can help, and give legitimacy to, public authorities making decisions that affect the public. Citizens’ juries put the public into public policymaking. Interested in commissioning a citizens’ jury? Access to appropriate academic and non-academic expert witnesses.